Medications | Medication | Out of Sight, Out of Mind? ALWAYS TAKE A COLD DRINK WITH TABLETS – Many tablets, e.g. Lithium, are ‘slow release’, which means they have a delayed adsorption rate coating that is undermined when taken with a hot drink. Always take tablets with a cold drink. Lithium is one of the best tested, longest used treatments since the 1960s, and also one of the most effective interventions for bipolar. Psychiatrists are now moving away from the newer medications, because of side effects, back to the old treatment, Lithium. Points to remember: always take the prescribed dose. Appropriate doses can vary widely from person to person – even people of similar weights. Make sure you get regular blood tests. Your GP may request further tests to be done, e.g. thyroid and kidney function. Lithium levels can rise as you lose fluid, so be wary in hot weather and during vigorous exercise, and limit your consumption of diuretics, including coffee and alcohol. If you experience vomiting, dizziness, lack of coordination, blurred vision or other signs, contact your doctor immediately. Lithium wasn’t cooked up in a multi-million dollar lab. It is a naturally-occurring salt that happens to calm the nerves, and when used under a doctor’s supervision, has manageable side effects for most people. It is often effective in managing both poles of bipolar – mania and depression. One of the biggest challenges with Lithium is that blood levels must be maintained in a very narrow range. Extracted from Bipolar Beat by Candida Fink, MD and Joe Kraynak. A brief history of the uses of Lithium, courtesy of the Wall Street Journal. Here are a few interesting facts. Lithium’s frail figure, just three electrons, makes it one of nature’s nimblest acrobats, able to wriggle in and out of the narrowest molecular crevices. It is also an inordinately attractive little atom, apt to bond with nearly anything. It is the lightest solid element on earth, as cheap as beer and simpler than air. Yet the designers of the Space Shuttle clamour for the stuff and so do a million swimming pool owners, the makers of the Titleist’s golf ball, the international frit industry (frit is a ceramic composition that has been fused, quenched to form a glass, and then granulated; it forms an important part of the batches used in compounding enamels and ceramic glazes), and discriminating grease consumers everywhere. The result – a stunning transformation wherever Lithium goes. Taking medication for the first time can be a little daunting, but with some helpful aids & tips your fears can be alleviated. I use a PILLMATE pillbox. This is a pillbox which has sections divided up into days of the week, i.e. Monday to Sunday. Each day has four sections including Morning, Noon, Evening & Night. You place whichever tablets you need to take at a particular time into the section, i.e. I take one tablet at night. You can then dispense your week’s worth of medication into the box. Using this pillbox means that it helps organise your medication, & reminds you of the need for a repeat prescription. I also use a PILLMATE pill cutter. This is a small plastic device with a blade which enables you to cut tablets in half. This is particularly useful if your medication dosage is reduced. Both the Pillmate pillbox & pillcutter can be bought at chemists including Boots. The pill cutter is even available in different colours! It helps to get into a routine of when you take your medication. Try to take it at the same time each day, so it helps you to remember to take it. If you take medication in the evening, perhaps switching off the television, taking a bath or reading can help with relaxing. 1) Make sure you have enough medication for the duration of your holiday. If necessary, contact your GP to ask for extra meds. 2) Make sure you pack some meds in your hand luggage as well as, or instead of, your suitcase. This is because if any of your luggage gets lost, you will still have some medication with you. 3) If possible, obtaining a photocopy of your repeat prescription is a good idea. In any emergency, a doctor will be able to see what current medication you are taking, and customs officers may require to see it to validate any medications you are carrying. I hope these tips help you & make your life a little easier. If you want immediate advice on any mental health medication, call the Mental Health Medication Helpline at the Maudsley Hospital. The helpline provides independent advice and information about mental health drugs to patients and carers, and is staffed by experienced mental health pharmacists. Tel: 020 7919 2999 or 0203 228 6000. Opening hours: 11 am to 5 pm Monday to Friday, excluding Bank Holidays. Keep taking the tablets. “To stop taking psychiatric medication without medical supervision may have serious consequences for your health.” Source: Psychiatric Nurse. “If you should forget to take your medication at the appropriate time, then wait until the next scheduled dose to continue your treatment. This will maintain the continuation of your medication, without the risk of overdose.” Source: Occupational Therapist. “Lithium is a wonder drug that has revolutionised psychiatric medicine, but in order for it to work the patient has to take it.” Source: Hospital Library book. Beware of possibly well meant, but ignorant and potentially harmful, comments such as: “Lithium is a placebo, you don’t have to take it.” Source: Care Assistant. Increasing the dose of an antidepressant without medical supervision may result in a decrease of benefit, if the medication response curve is not considered. With reference to the graph above, it can be seen that an increase in the dose may be detrimental to the mood, and may even make one feel worse than before treatment. A substantial increase in dose may be required to elevate the mood more, but unfortunately this could result in unacceptable side effects. 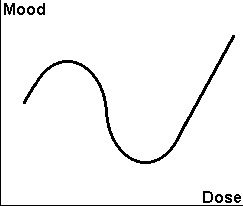 The finer details of the response curve may vary between patients, and all adjustments to the dose should be authorized by the prescribing doctor. “Do not exceed the stated dose.” Source: Pharmacist. “Not many GPs know about the response curve.” Source: Mind. Always remember that there are lies, damn lies and statistics. If you torture data sufficiently, it will confess to almost anything. I am most fortunate to have attended the self-management course hosted at Herts Mind Network. The issue of self-medication was thoroughly discussed. I was able to implement this knowledge recently, which I believe empowered me to avoid an admission to hospital. I feel a lot better now. Thank you, Herts Mind Network. God bless. Yours sincerely, Bob Houlston. Contact Herts Mind Network via tel: 01442 215117. Always read the Patient Information leaflet that comes with your medications, and never ever throw them away. If you didn’t get a leaflet, you may request one. If you still don’t get one, then complain vociferously, but politely. Some doctors tend to take a dim view of patients who know too much about medications, so tread lightly, when and where appropriate. Diagnosing yourself from a website is like defending yourself in court – you suddenly have a fool for a doctor. Don’t be a cyberchondriac, thinking you have every ‘dis-ease’ you see a website about, or that you’ll get every side effect from every medication. Anyone with a history of mental illness, who needs advice on appropriate psychiatric medication, needs to be discussing that with a doctor, and not getting their information from some stupid website. Get off your computer and start making appointments! 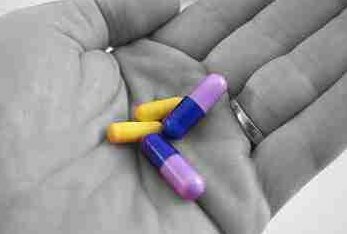 A support worker in a Day Centre sometime ago asked me: “Bob, do you believe that your medication makes you well?” I replied: “No I don’t. No doctor has ever required of me to believe that my medication makes me well; they merely insist that I take it. It is not necessary for me to believe.” My illness feels like a psychological issue, but is apparently a dysfunction of my brain. I believe that my bipolar affective disorder is predominantly a genetic issue. Metaphorically speaking, genetics load the gun and environmental factors pull the trigger. My Lithium medication appears to enhance the functioning of my brain, so it is a good thing that I take it. After all, why should I settle for what I was born with? Anosognosia is a condition in which a person who suffers disability seems unaware of, or denies the existence of, his or her disability. Although largely used to describe unawareness of impairment after brain injury or stroke, the term ‘anosognosia’ is occasionally used to describe the lack of insight shown by some people who suffer from psychosis, and who therefore do not have the insight to recognize that they suffer from a mental illness. For individuals with severe mental illnesses, lack of awareness of illness is significantly associated with both medication non-compliance and re-hospitalisation. Fifteen per cent of individuals with severe mental illnesses, who refuse to take medication voluntarily under any circumstances, may require some form of coercion to remain compliant, because of anosognosia. One study of voluntary and involuntary inpatients confirmed that committed patients require coercive treatment, because they fail to recognize their need for care. Predictably, the patients committed to the hospital had significantly lower measures of insight than the voluntary patients. It has been suggested that mental patients with anosognosia, and who are not compliant with their medication régime, should be paid (£15 per week typical) to take their medication and/or attend a depot clinic. This would have the dual effect of enhancing the treatment of the patient, and saving the cost of repeat hospitalisation. This idea has been criticised for being coercive. This page was added on 22/06/2010. as someone who hopes to shortly be working in mental health this is a very interesting read.